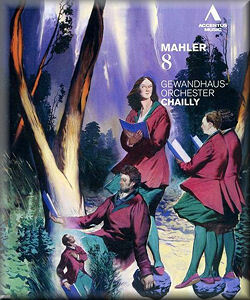 Part I of the Mahler 8, with its fervid invocations to the creative spirit, is taxing for all involved, not least because it needs to build, wave upon wave, before it crashes onshore in spectacular style. That it doesn’t in this case is largely due to Chailly’s sluggish speeds, the music all too quickly becalmed. As for the soloists, they’re not terribly well blended, and although the choirs are robust in the tuttis they’re apt to disappear in a huge, warm backwash of sound. Matters improve slightly at the return of the great hymn, but by then it’s much too late. Antoni Wit on Blu-ray Audio – review – is far more elemental, sensing that deep swell and letting the waves break at their highest point. By contrast, Chailly’s Part I lacks that mighty ebb and flow; instead, we’re presented with a series of whorls and eddies that advance and withdraw. Very frustrating indeed.